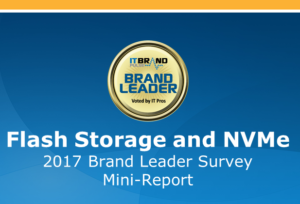 SAN DIEGO, CA—July 26, 2017—IT Brand Pulse, a trusted source for research, data and analysis about data center infrastructure, today announced the results of the recent IT brand leader survey covering Flash Storage and NVMe products. Micron locked down a repeat sweep of NVDIMM leadership (Market, Price, Performance, Reliability, Service & Support, and Innovation), with HPE and Viking Technology earning all-around second and third. 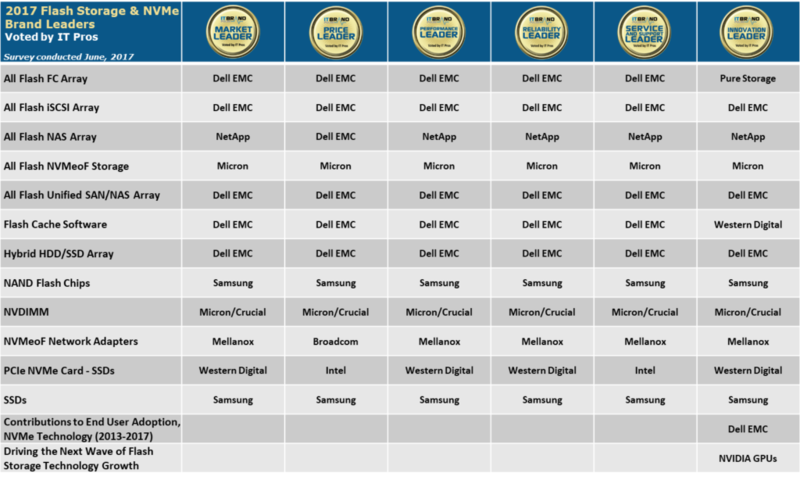 In light of the demise of Dell EMC’s DSSD business several months ago, the door opened for Micron to burst onto the scene as the choice for Market, Price, Performance, Reliability, Service & Support, and Innovation winner this year, besting E8 Storage (second place) and X-IO (third) in every leader category. Samsung upped its presence in the annual flash surveys, not only taking Market Leader (fourth time), Innovation, Performance (both for the fifth year in a row) and Reliability (third straight year), but also adding Price and Service & Support awards for 2017. Western Digital and Toshiba followed, rounding out the top three Market Leader positions. Even though this product category has never been polled in the IT Brand Pulse surveys, Samsung’s accomplishment as 2017 Market, Price, Performance, Reliability, Service & Support, and Innovation leader may not have been entirely unexpected: two years ago, voters singled out Samsung for Contributions to Innovation in 3D NAND Flash (2010 – 2015). In the case of NAND Flash Chips, Western Digital and Micron rounded out the top three Market Leader slots. IT pro respondents were asked to bestow special innovation achievement honors in the 2017 Flash Storage and NVMe brand leader survey. 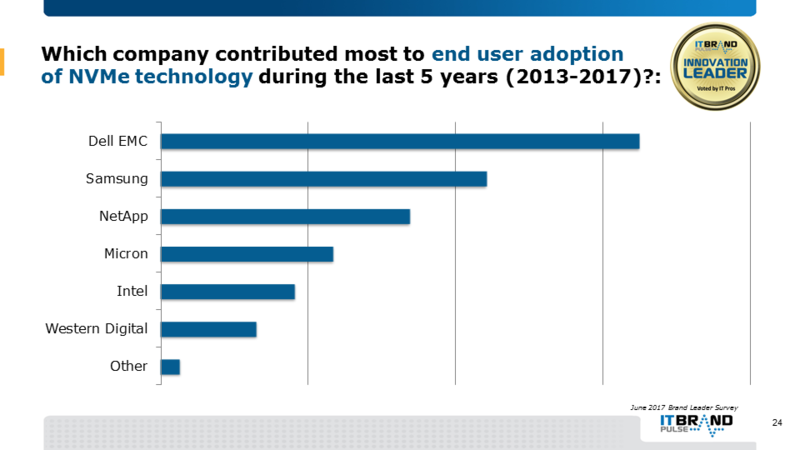 For “Who contributed most to end user adoption of NVMe technology over the past five years?” voters selected Dell EMC over second-place, NetApp, Micron, Intel, and Western Digital filled in the remaining lineup, respectively. In the six years All Flash FC Array has been included in the IT Brand Pulse annual survey, Dell EMC laid claim to a fourth victory. Recognized as 2017 Market Leader for All Flash FC Array, Dell EMC also picked up Price, Performance, Reliability, and Service and Support awards. Pure Storage—Market runner up in 2016—appeared on the winners’ board as Innovation Leader. NetApp and HPE finished second and third for Market Leader. Yet another four-peat for Dell EMC emerged as it swept all leadership in this category: Market, Price, Performance, Reliability, Service & Support and Innovation, followed by NetApp and HPE, accordingly, as Market Leaders. Dell EMC edged out the two-time overall reigning champ (NetApp) to capture Market, Price, Performance, Reliability, Service & Support and Innovation titles. Echoing both the flash iSCSI and FC results, NetApp took second place Market Leader, with HPE, third. Dell EMC secured a fifth Market Leader spot and swept the remaining categories of Price, Performance, Reliability, Service & Support, and Innovation. Like last year, HPE was number two for Market leadership, ahead of NetApp. In 2017, IT professionals voted in a new name—Dell EMC—as the victor for five out of six classes of distinction: Market, Price, Performance, Reliability, and Service & Support. Western Digital, the incumbent Market Leader (and this time around the runner up in front of NetApp), held on to the Innovation honor. NetApp extended its streak to four consecutive years as the Market, Performance, Reliability, Service & Support and Innovation champion. Dell EMC, chosen as the Price Leader, was the second Market finisher, ahead of HPE. Western Digital collected its sixth Market, Performance, and Innovation awards, and third for Reliability. Intel (next in line for the Market position, before Dell EMC) broke up the clean sweep by being named Price and Service & Support leader. For the second straight time, IT pros tapped Mellanox for Market, Performance, Reliability, Service & Support and Innovation honors. Price (and number two Market) Leader was awarded to Cavium/QLogic was designated third, overall. The final special achievement in innovation award in this brand leader survey centered on who and what was leading the charge in accelerating the flash industry. 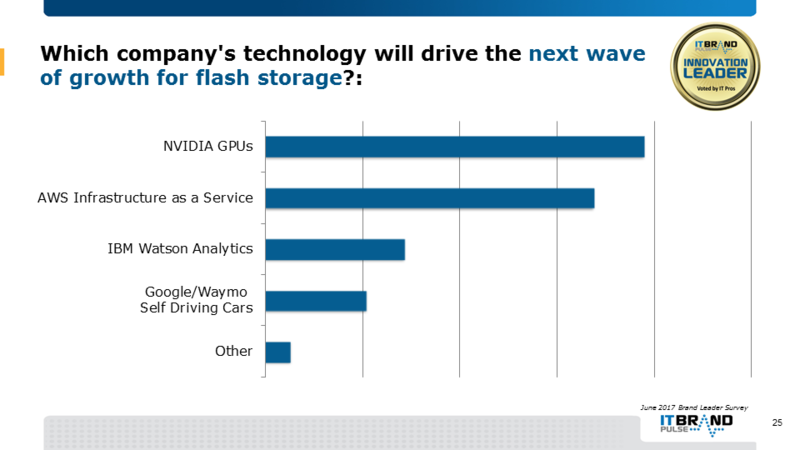 For the question, “Which company’s technology will drive the next wave of growth for flash storage?” NVIDIA GPUs stood out in end user perceptions over the competitors AWS Infrastructure as a Service, IBM Watson Analytics and Google/Waymo Self Driving Cars (in order).